Modern warfare is a war of narratives, where bullets are fired both physically and virtually. Whether you are a president or a terrorist, if you don't understand how to deploy the power of social media effectively you may win the odd battle but you will lose a twenty-first century war. Here, journalist David Patrikarakos draws on unprecedented access to key players to provide a new narrative for modern warfare. He travels thousands of miles across continents to meet a de-radicalized female member of ISIS recruited via Skype, a liberal Russian in Siberia who takes a job manufacturing "Ukrainian" news, and many others to explore the way social media has transformed the way we fight, win, and consume wars-and what this means for the world going forward. This is a book that, unlike its title, will survive the test of time. Author David Patrikarakos is not only an intrepid journalist, but also an original thinker. He lectures you a whole lot and tends to hang on to the points he makes for far too long, but you forgive him, because he takes you places others haven’t. Literally and figuratively. The point is also made that in a world of fixed borders –Crimea notwithstanding—the aim of war is often to send a message. The order of events no longer is 1. win on the battlefield 2. get your way with the arrangements for peace. The dynamic has been reversed. The author does not talk in bulletpoints. Instead, you follow him on a breathless and occasionally perilous tour of the battlefield, virtual or otherwise. He starts with a charming teenager in Gaza, moves on swiftly to the headquarters of her competition at the IDF, from there to a vigilante housewife who privately crowdsources and personally arranges for the delivery of supplies and military equipment the Ukrainian military, takes part in a delivery himself, moves on from there to St. Petersburg to interview a professional troll, introduces you to the crowdsourced forensic evidence regarding the downing of MH17 and interviews a mom who joined ISIS in Raqqa and lived to tell. And he caps it all off with a tremendous concluding chapter, which ties all the strands together and could stand alone as some of the most compelling reading I’ve ever had the pleasure to enjoy. It’s cliché, but the conclusion alone is worth the price of purchase. Start with that, I say. How does it compare with Zeynep Tufekci’s epic “Twitter and Teargas?” I loved it (him?) less, but it taught me more. As a former US Army Information Operations Officer I found this book fascinating and informative. 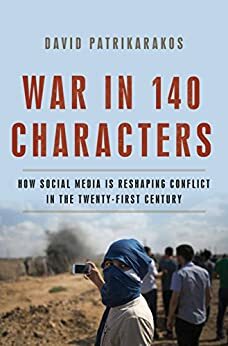 The author’s understanding of how social media is driving Operations in today’s undeclared grey zones of conflict sets the conditions for the reader’s understanding of the modern operational environment. Using several examples from recent conflicts he shows how Information Operations is the main effort with kinetic operations supporting in order to shape public perceptions and set the conditions for a favorable outcome. I recommend this book for those engaged in Information Operations as well as planners working at the operational and strategic levels; or just anyone looking for an interesting read. This book should rock the world of international politics. See war is just an extension of politics. Now the power of the word transmitted over the internet has the power of a carrier or an army division. This book shows you how it is happening today and how governments and groups are organizing to deal with it. Propaganda has always been around for most of recorded time. However now the speed of how propaganda spreads has accelerated at least 100 fold since the days of Goebbels in WWII. This book will explain how this is happening. It shows you how social media is changing the world armies are fighting in. The examples listed in the book are narrow but conclusive. David Patrikarakos shows how citizen journalists in the war zone report things and it gets out to hundreds of thousands if not millions. His documentation of how the Israelis have organized to utilize social media is revolutionary. He goes into the staffing, organization and doctrine. I hope the Generals in the Pentagon read that chapter at a minimum. Then you see how social media makes a huge impact in the Ukraine. People raise money for the fight over the internet. People sitting in their homes on the couch use social media to collect intelligence which only ten years ago would have been only available to governments. This book has material you won't find in other books and only a handful of magazines. I think all in the defense world need to read this. Interesting premise with probably a good deal of truth to it. I WANTED to like this book and to find certain new truths about conflict illuminated. But some of the reasoning is sloppy. Sorry I don’t remember specifics; I stopped reading the book a few weeks ago after coming across the third or fourth point I considered exaggerated or otherwise flawed - only about 10% of the way through. The author seems to want so bad to write something revolutionary that he doesn’t soberly analyze some of the claims he’s making. Eye opening accounts and case studies of use of social media in and around war. Somewhat overstated effects, but this is not over the top hype, this is where we are today.